The lidR package provides functions to read and write .las and .laz files, plot point clouds, compute metrics using an area-based approach, compute digital canopy models, thin lidar data, manage a catalog of datasets, automatically extract ground inventories, process a set of tiles using multicore processing, individual tree segmentation, classify data from geographic data, and provides other tools to manipulate LiDAR data in a research and development context. Development of the lidR package between 2015 and 2018 was made possible thanks to the financial support of the AWARE project (NSERC CRDPJ 462973-14); grantee Prof Nicholas Coops. Development of the lidR package between 2018 and 2019 was made possible thanks to the financial support of the Ministère des Forêts, de la Faune et des Parcs of Québec. :book: Read the Wiki pages to get started with the lidR package. In R-fashion style the function plot, based on rgl, enables the user to display, rotate and zoom a point cloud. Because rgl has limited capabilities with respect to large datasets, we also made a package PointCloudViewer with greater display capabilities. lidR has several algorithms from the literature to compute canopy height models either point-to-raster based or triangulation based. 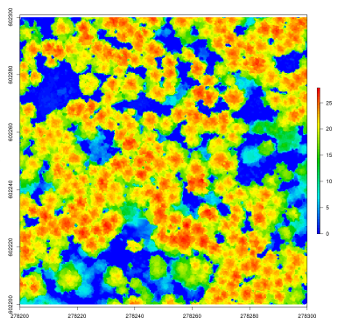 This allows testing and comparison of some methods that rely on a CHM, such as individual tree segmentation or the computation of a canopy roughness index. lidR enables the user to manage, use and process a catalog of las files. The function catalog builds a LAScatalog object from a folder. The function plot displays this catalog on an interactive map using the mapview package (if installed). From a LAScatalog object the user can (for example) extract some regions of interest (ROI) with lasclip. Using a catalog for the extraction of the ROI guarantees fast and memory-efficient clipping. LAScatalog objects allow many other manipulations that can be done with multicore processing, where possible. The lastrees function has several algorithms from the literature for individual tree segmentation, based either on the digital canopy model or on the point-cloud. Each algorithm has been coded from the source article to be as close as possible to what was written in the peer-reviewed papers. Our goal is to make published algorithms usable, testable and comparable. Most of the lidR functions can process seamlessly a set of tiles and return a continuous output. Users can create their own methods using the LAScatalog processing engine via the catalog_apply function. Among other features the engine takes advantage of point indexation with lax files, takes care of processing tiles with a buffer and allows for processing big files that do not fit in memory. lidR has many other tools and is a continuously improved package. If it does not exist in lidR please ask us for a new feature, and depending on the feasibility we will be glad to implement your requested feature. To install the package from github make sure you have a working development environment. Mac: Install Xcode from the Mac App Store. area Surface covered by a LAS* object. grid_hexametrics Area-Based Approach in hexagonal cells. tree_hulls Compute the hull of each tree.